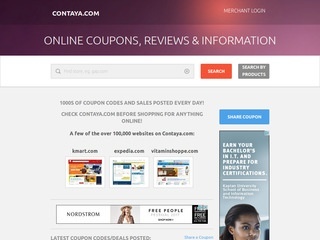 This page carries general Contaya.com articles, news updates, etc. Add one here! Quality of this article: (11 votes) No comments. Check Out These 50% Off Hotel/Resort Deals! Quality of this article: (8 votes) No comments. Save Big On Tosiba Laptops! $25 restaurant gift certificates for as low as $2! How to Find Your Really Desired Wedding Dress Online? Quality of this article: (7 votes) No comments. Free Ceramic Tile Samples - No Credit Card Needed! Quality of this article: (6 votes) No comments. Eleven Merchants That Ship Great Deals Anywhere! Quality of this article: (9 votes) No comments. Awesome Restaurant.com Dining Certificate Deals! Quality of this article: (10 votes) No comments. San Diego September Hotel Deals! Special Back to School Savings on Select Lenovo Laptops! Save $150 on an awesome Lenovo laptop! Save up to $175 on Last Minute Southwest Airlines Vacation Deals! 4 Days Only - Get the DROID X FREE!